None of us wake up and think, “today is the day I get in an accident!” No, accidents happen unexpectedly. Even if you assume that one day you will eventually get into an accident, you never know how severe the accident will be, where it will happen, or when! For this reason, it is important to be prepared for anything. A huge part of being prepared is having a roadside emergency kit. It is something all drivers should have stowed away somewhere in their trunk. In a true emergency, having a well-stocked kit could make all the difference. Knowing that you are prepare, will also grant you some much-deserved peace of mind. A blowout or flat tire can quickly ruin your day. If you are not prepared, it could also leave you stranded by the side of the road. Make sure you have an inflated (important) spare tire available. You will also need a car jack to lift the car and a proper wrench to loosen the bolts attaching the tire to the car. Most vehicles come equipped with all of these necessities, but make sure you have them before you get on the road. If you have all the proper tools, there is no reason you can’t be back on the road in a matter of minutes. You want to be able to signal your distress. This is especially important at night when visibility is poor. First, activate your hazards. As part of your emergency kit have at least three collapsible, light reflective emergency cones. Evenly space them around your disabled vehicle. 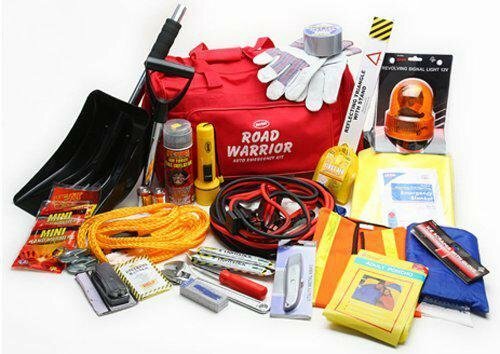 Other items you should have in your roadside emergency kit include jumper cables, a multipurpose tool, a tire gauge, a small fire extinguisher, and a first aid kit. It is further important to consider the region in which you live. If you are driving in a desert, you should always have extra water. If you are driving in the snow, you should invest in tire chains and something to keep you warm incase you break down.